Tool-X is Developed By Rajkumar Dusad. 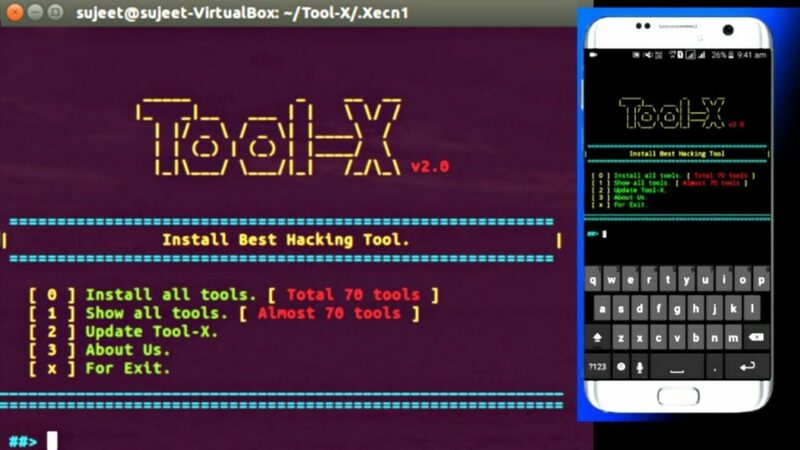 with the help of Tool-X you can install best hacking tools in Rooted or Non Rooted Android devices. In the Tool-X there are almost 240 hacking tools available for termux app and GNURoot Debian terminal. you can install any tool by single click. Tool-X is Specially made for Termux and GNURoot Debian Terminal. Now Tool-X is available for Ubuntu. Type 1 : to show all available tools and type the number of a tool which you want to install. Type 5 : if you know About us. Type x : for exit. Now type Tool-X from anywhare in your terminal to open Tool-X. How to Install in GNURoot Debian Terminal ? Open the GNURoot Debian app and type following commands. Now type Tool-X from anywhare in your terminal to open Tool-X. But use this tool only for legal purpose. Now type Tool-X from anywhere in your terminal to open Tool-X. But use this tool only for legal purpose. November 1, 2016 haxf4rall2017 Comments Off on Hack any Mobile APP – Reverse engineering and Analysis Framework.